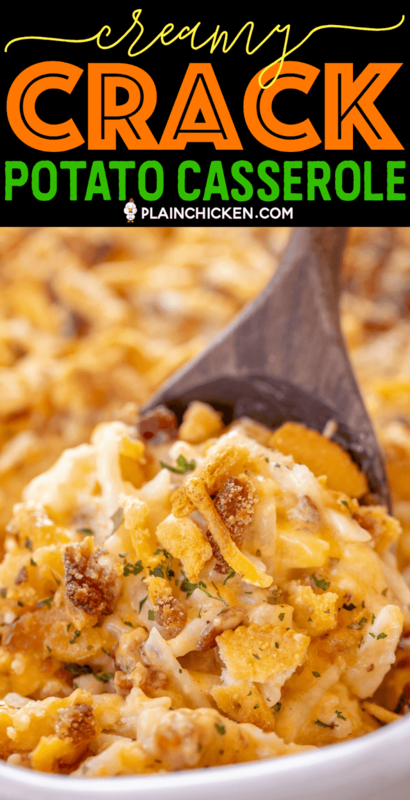 Creamy Crack Potatoes - creamy potatoes loaded with cheddar, bacon, and ranch! SO good! Frozen shredded hash browns, cheddar, bacon, ranch dressing mix, sour cream, cream of chicken soup, heavy cream, butter, and Ritz crackers. 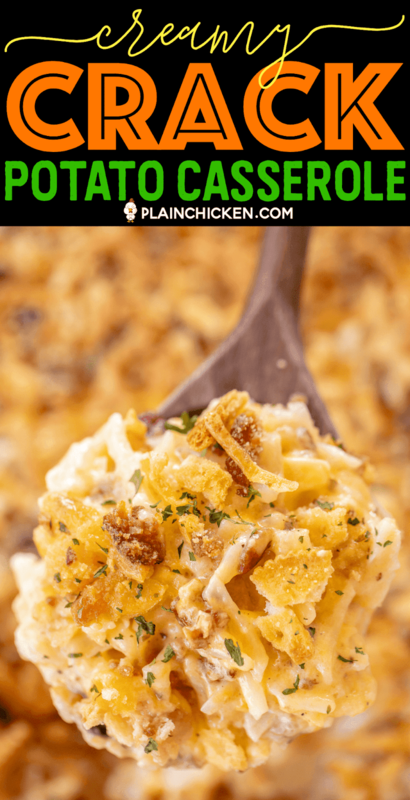 A cross between scalloped potatoes and a regular potato casserole. I could make a meal out of these potatoes!!! Can make ahead and freeze for later. Great for a crowd. 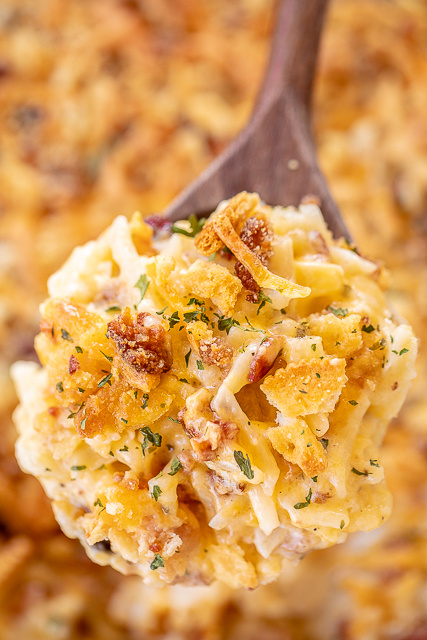 There are several versions of Crack Potatoes on the blog, but this one might be my favorite. 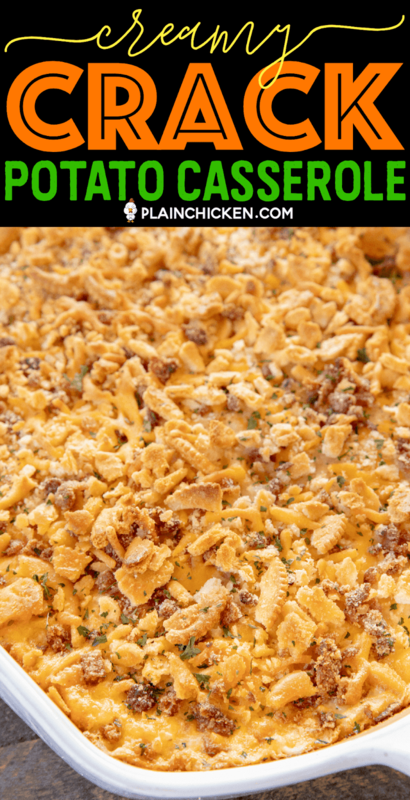 It is a cross between scalloped potatoes and regular potato casserole. It is SO good! 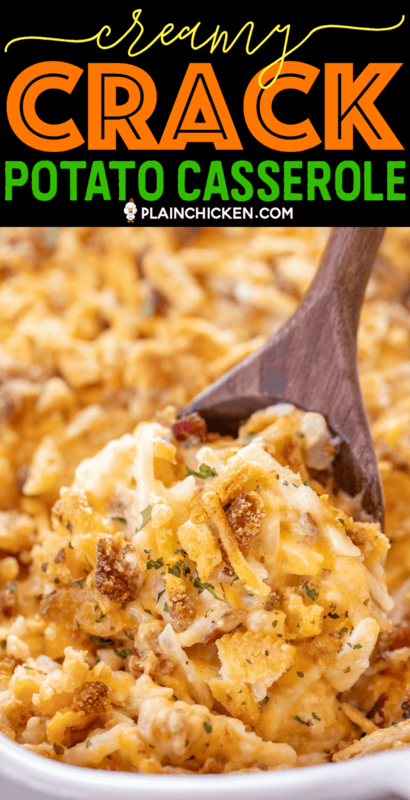 Creamy potatoes loaded with tons of cheddar, bacon, and ranch. YASSS! I actually ate just these Creamy Crack Potatoes as my lunch when I made them for the blog. Just a big ol’ scoop of potatoes. SO good!! I created Crack Potatoes by accident back in 2011. I had made a double batch of Crack Dip for a football game. I forgot it and needed to figure out how to use all that dip. I thought - what about a potato casserole? And Crack Potatoes were born. They are called Crack Potatoes because they contain the combination of cheddar, bacon, and ranch. Cheddar + Bacon + Ranch = Crack. It is an addicting flavor combination! 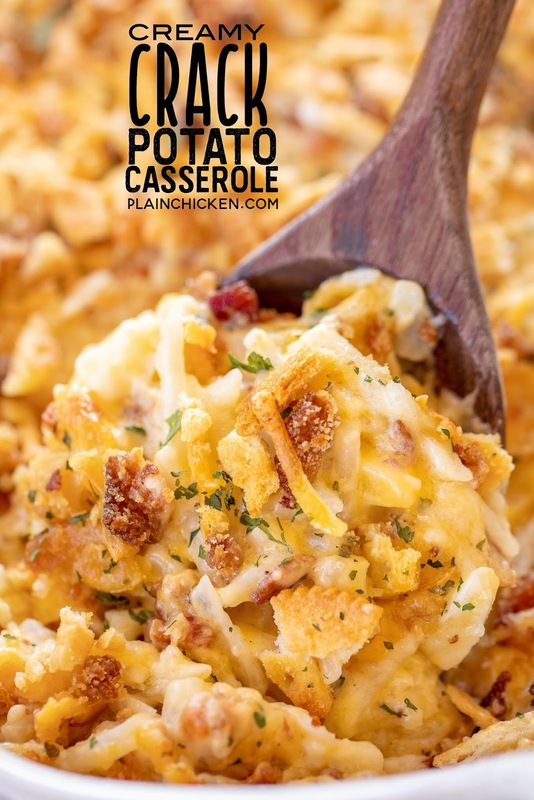 Can This Potato Casserole Be Frozen? Absolutely! These Creamy Crack Potatoes can be made ahead of time and frozen unbaked for later. I like to split the potatoes between several foil pans. I will bake one and freeze the others for a quick side later. Thaw the potatoes in the refrigerator before baking. I bake the smaller pans for about 30 minutes. Just check your pans and when they are bubbly, the potatoes are done. These Creamy Crack Potatoes are on repeat in our house. We love to serve these with steaks, grilled chicken, pork chops, burgers - anything!! I just ordered the stuff to make another batch to fill up the freezer. 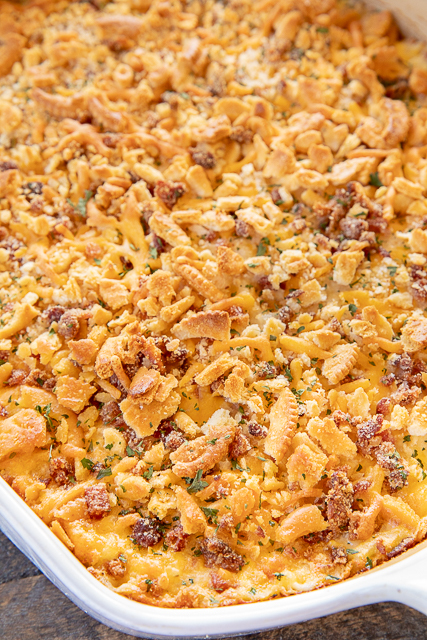 Don’t skip the topping - Ritz crackers, cheddar cheese, and bacon. It really puts the potatoes over the top! Add this to your menu ASAP! You won’t be disappointed! Don't forget to follow us on Pinterest for more recipe ideas! Preheat oven to 400ºF. Lightly spray a 9x13x2-inch baking dish with cooking spray. 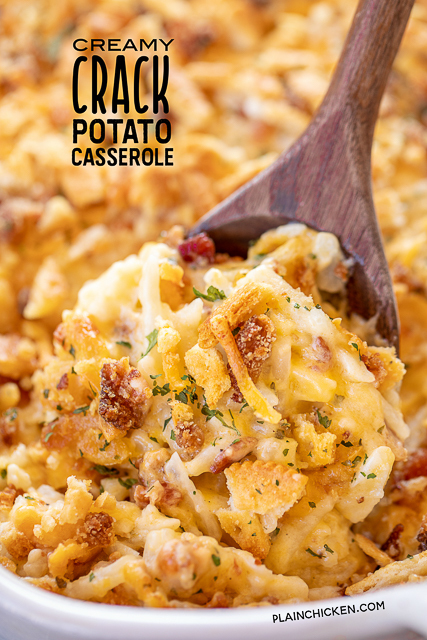 In a large bowl, combine hash browns, cream of chicken soup, 2 cups cheddar cheese, heavy cream, butter, sour cream, ranch packet, and 1 cup cooked bacon. Spoon potato mixture into prepared pan. 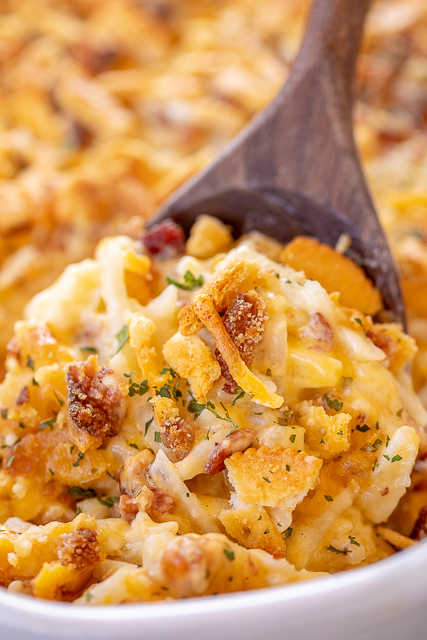 Combine crushed crackers, 1/2 cup bacon, and remaining 1/2 cup cheddar cheese. Sprinkle over potatoes. Bake, uncovered, for 45 to 50 minutes, until bubbly. These would be great too if you added rotisserie chicken to them! yum!